Do you use Pinterest hashtags? Should you use Pinterest hashtags? That’s the question. For years, Pinterest has been telling us not to use them – unless it’s one, branded hashtag. Recently, though, there’ve been some weird goings-on where hashtags in Pin descriptions become clickable on desktop – then not. Hashtag buttons appear on mobile – sometimes. This blog post was originally published on August 23 with a lot of rumors and innuendoes. Pinterest finally published an official statement on September 29, 2017. These updates are directly below, with my current thoughts as of November 1, with older info below. Hashtags are a word or phrase preceded by a hash (#) used to identify Pins on a specific topic. NEW! Hashtags on Pinterest work just like they do anywhere else. When you add hashtags to the description for a new Pin, other Pinners can visit a feed of all the Pins that share that hashtag. The freshest Pins will be right up top. Unlike normal search results on Pinterest, these will be shown in (mostly) chronological order. You can discover related content by clicking on a hashtag in Pin description. You can also search for a Hashtag, like “#interiordesign” or “#healthyrecipes”. If you search the same phrase without the hashtag, it will pull up the original search results page. How do I add hashtags to Pins? And how many? Add hashtags for Pins in the description. To add a hashtag, type “#” and add a keyword or phrase. As of Sept. 29, I see suggested hashtags pop up with a number following. Many say 0! While you shouldn’t use hashtags that are crazy popular and vague, hashtags with under 100 uses are probably not going to help you get found. I’m going with a selection of tags that are mostly in the 1,000 to 10,000 uses range. See screenshot: This is in the Pin description when I Save a new Pin. I do not see this when editing a Pin description. I suggest you search hashtags that you’re considering using (enter “#yourhashtagphrase” in the Pinterest search bar) and check out the content in the search results to make sure it’s relevant to yours. When inserting a hashtag, Pinterest recommends you be specific and descriptive. Use words or phrases that describe the content in the Pin. Add no more than 20 hashtags per Pin. I recommend using at least 4 hashtags per Pin. As of October 21, Pinterest is showing 4 hashtags instead of a Pin description under the Pin previews in streams and on boards. If you’ve used more than 4, only the first 4 will show here. You do have 500 characters to use in your Pin description, so you can add more than 4 hashtags. Remember that hashtags have to be an exact match to be found in that hashtag feed. But also be aware that many Pinterest users are complaining about excessive hashtag use and calling it spammy. Don’t overdo it! It’s best to be objective and use hashtags that make sense and are relevant to the Pin. Depending on your Pin, consider using hashtags that are timely (e.g. #oscars, #backtoschool, #halloween) and/or hashtags for evergreen content that works well on Pinterest (e.g. #mealplanning, #hairgoals, #homedecor). This is to help make it easier to for users to filter and find relevant content they are interested in. I recommend putting hashtags at the END of your description. You want them to lead Pinners TO your content, not away from it. If you want to change your hashtag later, edit the Pin description. But since hashtag searches are turning up recent Pins, I don’t see a need to edit old Pin descriptions to add hashtags. Do add hashtags when repinning a previous Pin. Now you’ve got a fresh one! I’ll take you from setting up your account correctly to making simple, pinnable images, in this FREE e-course. Get ONE simple action step each day. Join now! No worries, you won’t leave this page, so you can finish reading! Add hashtags for Pins in the description by typing “#” followed by a keyword or phrase. When Saving a new Pin, suggested hashtags pop up with a number. Choose tags in a medium range of uses. Be specific and descriptive. Use words or phrases that accurately describe the content in the Pin. IF relevant to your Pin, use both hashtags that are timely, and ones that are evergreen. Search hashtags that you’re considering using. Enter “#yourhashtagphrase” in the Pinterest search bar, and ensure the search results are relevant. Add no more than 20 hashtags per Pin. The first 4 added will appear under the Pin in feeds. I suggest using 4 to 8 maximum hashtags. More may look spammy. Put hashtags at the END of your description to lead Pinners TO your content, not away from it. If you want to change your hashtag later, edit the Pin description. Since hashtag searches favor recent Pins, don’t edit old Pin descriptions to add hashtags. Continue your keyword strategy on Pinterest, as most Pinners will discover your content via keywords. Be sure to make eye-catching Pins, so that yours get clicked in the hashtag feed. 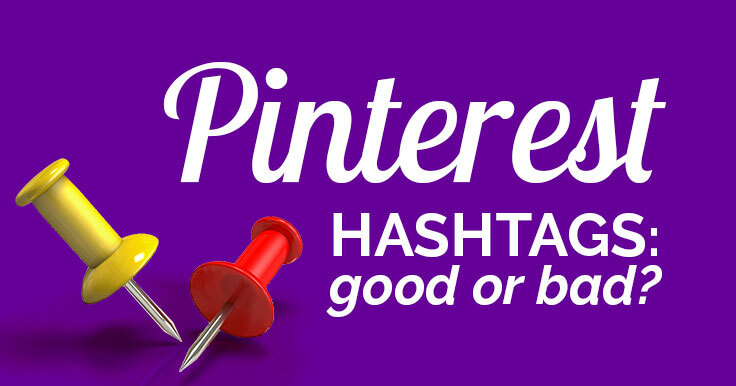 Hashtags on Pinterest ONLY work in Pin descriptions! Don’t use them elsewhere. 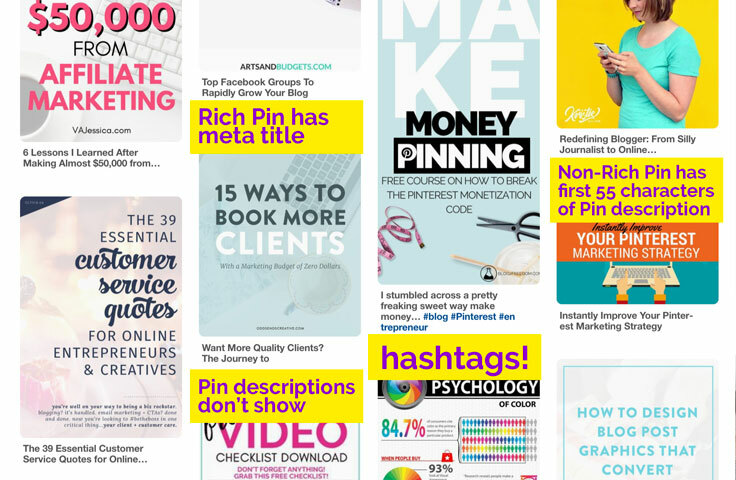 Are Pinterest Hashtags Actually Helping? 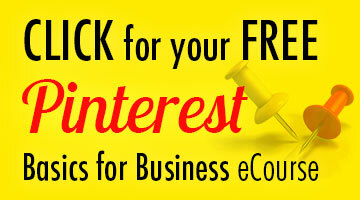 I would strongly recommend you continue your keyword strategy on Pinterest. I believe this will be the way most Pinners will discover your content. However, hashtags give us another avenue to be found – via users clicking hashtags on others’ Pins. Pins in the hashtag feed will show up freshest first, so the more often you Pin with relevant hashtags, the better chance you have of being seen in the hashtag feed. I personally have been using hashtags on Pinterest for 2 months now. At first, I used 2-3 per pin, and since Pinterest’s announcement, am now using about 6. I have about 1,800 pins out now that are hashtagged. My repins, views, and website traffic are up. I can’t say for certain it’s due to hashtags. Even before hashtags, I started repinning only content that’s performing, so that could be the reason. Some users are reporting flat results, and others say they’re helping. I haven’t heard a single user report that their Pinterest results are down since using hashtags. For me, Pinterest continues (after almost 2 years) to send the most traffic to this one viral post. That Pin has no hashtags. And I haven’t pinned it for months! I believe we can’t ensure specific results on Pinterest, we can only enhance our chances. So I suggest you do include a few well-chosen hashtags at the end of your Pin description. As Pinners get more accustomed to how they work, their effectiveness will likely increase. Why aren’t my Pins showing up in the Hashtag Feed? Pinterest said that hashtag feeds would surface the freshest content first – but you may notice that the feed isn’t showing you all Pins with that hashtag, in completely chronological order. What shows up when a hashtag is searched has to do with a lot of different factors including a Pinner’s interests, searches, past history of engagement, etc as well as a vast majority of other signals. In general, our goal is to show the right Pin to the right Pinner at the right time. That means that it actually isn’t possible to force show a specific Pin of yours for the hashtag. So like I said above, we can’t make Pinterest bow to our wishes – we can only follow suggestions and see what works best for our own accounts. I first heard of this in a blog post. The author Vanessa was fortunate enough to visit Pinterest HQ in San Francisco. She met with Jackie, a Partner Manager. I read that August 21. Then on August 23, I was on a webinar with Pinterest and Curalate. Tiffany Black is the Head of Content Business Development and Corporate Development at Pinterest. During the webinar, she mentioned both keywords and hashtags, and fielded a couple pointed questions later. There’s now (Sept. 29) an official recommendation from Pinterest on number to use: no more than 20. Heck, that’s a lot! Jackie had said 1 or 2, but apparently that wasn’t an official Pinterest stance. It is true that In the past, I think that we were dissuading people from using hashtags. We are actually changing that such that you can and are often benefited in the future by using hashtags. As far as best practices go, the rule of thumb is use authentic hashtags but don’t keyword stuff essentially. So I know on other platforms you can often see people putting 50 or 100 hashtags on something. It’s not the volume of hashtags that’s really useful, it’s actually making sure you are using the hashtags that people will likely be searching for. So not trying to do like 100 because actually doing too many will decrease rank in some capacity because we will think it is possibly spam. So I would say we haven’t figured out exactly what the right number is. I don’t think that we will probably come out with an exact number but you know keeping it reasonable and using ones that are relevant to the content and authentic is the way to go. When asked whether keywords needed to be used in a sentence, Tiffany responded that it’s “preferred” to be conversational, but not critical enough to go edit past Pin descriptions. Here’s the lovely Kate Ahl’s take on Pinterest hashtags. Remember that this feature was just announced when Kate recorded this video. My thoughts are below. Should You Use Pinterest Hashtags in 2018? On October 21, 2017, Pinterest made a bold move in favor of hashtags: showing 4 of them under Pin previews in feeds (see screen shot above). To me, this says you should use hashtags on Pinterest – at least 4 per Pin. 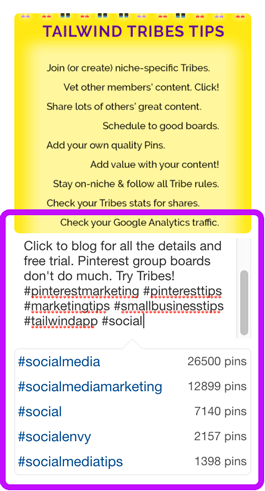 I plan to add four to six hashtags at the end of each Pin description going forward – but I won’t be A/B testing. Let me know if you do! I understand that you might be wary that hashtags are a bad thing for brands. I was too! And, it’s a golden opportunity for spam, sadly. Pinterest always said that hashtags can lead users away from our content. You’ll have to work extra hard at making eye-catching Pins, so that yours is the Pin that gets clicked in the hashtag feed. I’ve done well being found in keyword searches. Maybe you have, too. But who knows if that will continue? It seems hashtags may be prioritized. That’s why I think we need to jump on board. Pinterest doesn’t give us a lot of specifics on how to run our accounts – in the webinars, they have. So, I suggest to use four hashtags at the end of your Pin descriptions going forward. Not at the beginning – that has a much better chance of leading users away from your Pin. I strongly recommend you check out the returns from hashtag searches before deciding which ones to include in your post. While Kate mentioned using #pinterest, returns from that search were 95% reused Instagram posts that had nothing to do with #pinterestmarketing or #pinteresttips. It looks like going more niche with hashtags is more effective – at least for the search results. I’ll keep this post updated on how to use Pinterest hashtags 2018. Pin it, and check back! There are making so many changes, it’s a huge challenge to keep up with all of that. Will have to try it out and see if I will be happy about it. Thank you for the news Louise! I don’t use a brand hashtag anywhere and really don’t see a need for it. Nor do I understand why you would tag yourself in the description? Your account name is already a clickable link attached to the pin. It seems a touch spammy. What was the reasoning behind this? If you want to use a hashtag, I’d recommend doing what Pinterest says and use one or two highly relevant ones. 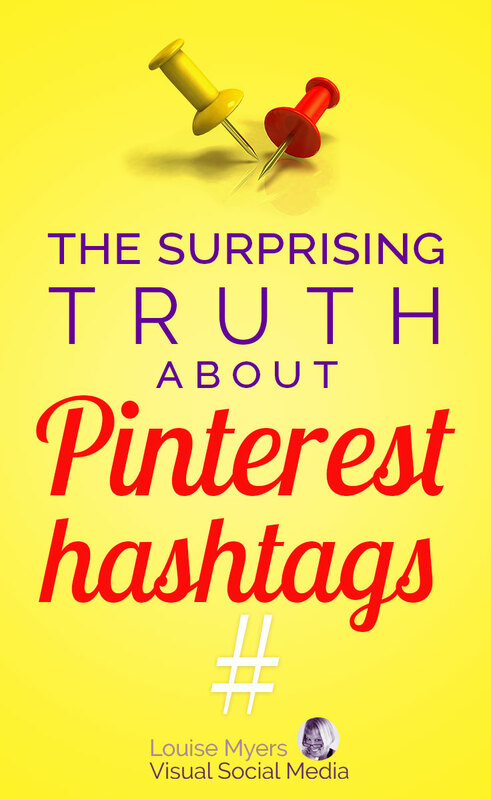 Always wondered about hashtags on Pinterest. I use a few but haven’t really noticed if it made my stats better or worse. It’s good to know they might be more useful in the future though. Pinterest has made a complete turn from their previous recommendation. Hope you see a change for the better! Good info Louise. The thing I like to remember about Pinterest is that it is not as much a social media channel as it is a search engine. I think keywords are much more powerful than hashtags will ever be there. I try and make sure the titles of pins and boards have at least one keyword in them that people will be using to find my info. Keywords function the same on Pinterest as they do on Google–both single words and long tail searches can be relevant. Just my two cents. I agree that keywords are incredibly powerful on Pinterest, and have been for the past few years. The fact that Pinterest is recommending the use of hashtags makes me wonder if they’ll continue to prioritize keywords. I’m not sure that Pinterest is sure exactly how this works yet! It’s still so new to them. There may be some overlap between keyword and hashtag searches. Not certain. In any event, I recommend using both keywords and hashtags that people are actually searching for. “OKC” seems like a brand acronym and I’m not sure how many people would know of it. ‘OKC’ is an acronym and popular #hashtag for ‘Oklahoma City.’ If you live here, you definitely search for it. But I see how it could easily be obscure for non-locals. Thank you for the heads-up. Thank you for the post, Louise! Why do you think hashtags may badly affect the brands? Glad you liked it, Marina! Possible spam, and that tags lead people away from your Pin. The best Pins and most frequent Pinners will probably win at hashtags. hi.. it is very good and helpful article. I’ve used 4-6 hashtag per-pin.. there also some pins that i didn’t put hastag on it. But i see no significant difference between with or without hashtag. Funny thing is, everytime i put common hashtag for my products like #christmasgift #holidaygift #metalflower etc, it won’t appear on that hashtag result no matter how many times i re-pin the picture to freshen the pin or clicked the hashtag, I even tried to search it from different Pinterest account but still my pin won’t appear on the result. But it will likely appear on an uncommon or more specified hashtag like #daisies #ironrose or a typo #christmastgift. It is kinda frustated me off.. so now I’m working more on keywords on the description than the hashtag. This is really very useful as the previous best practice on using Pinterest that I have recently read made no mention of hashtags whatsoever. I am pretty new to this platform so am trying to arm myself with the best information possible. Thanks very much! There’s definitely lots of outdated info around. Best of luck on Pinterest, Gavin! I am wondering if one can or should add # to other people’s content as it might bring people to your own boards? I have recently discovered Tailwind & it has got me thinking in so many new directions & you have the option to change the pin description. My opinion is that it’s a little shady to use / edit others’ content for your own gain. HOW CAN U TELL IF YOU HAVE EARNED ANY MONEY YOU SURE KNOW HOW MUCH YOU SPEND ADVERTISING THAT’S NO SECRET I PAY OVER 100 DOLLARS A WEEK PLUS SO IT WOULD HELP TO KNOW IF I AM MAKING OR BREAKING THE BANK AS A PENSIONER THAT’S IMPORTANT TO KNOW PLEASE LOUISE CAN YOU HELP ME THERE PLEASE LOUISE THANK YOU. I don’t advertise so I can’t help you with this. Thank you for taking time to put this hashtag information together Louise! Hi Louise, thank you for a good blog. However, I don’t know what’s wrong, but I can’t see the list of blue colored and hyperlinked hashtags rolling down with the number how many times they are being used in the description box like in your screenshot. And in search results, where my pins do appear, it seems like only the hashtags used in the beginning of description are hyperlinked on others pins, but as you said it’s better to place them at the end, but they are not hyperlinked. Has there been some changes in Pinterest since that? Yep, not sure what’s going on with this but *for the most part*, they’re no longer hyperlinked. Probably some changes afoot. I suspect they’ll return. The numbers still come up for me most of the time. This is in the Pin description when I Save a new Pin. I do not see this when editing a Pin description. Hi Louise, this information is very useful. I am experimenting with hashtags on pins and have only been using the relevant ones that pop up automatically as suggestions. I’ve noticed recently that some of them are no longer auto-populating (example, #lunch and #easyrecipes). Is it okay to use hashtags that are relevant but not auto-populating to help drive traffic to our site? I am unable to find anything definitive on this. Yes, that feature is buggy anyway. I don’t find it helpful even when it works! Will be updating this post as time permits. I just started to promote my travel blog and nothing is going on yet, hope these hashtags will enlight the way to my funny website, thank you for sharing these informations. Is there any other way to rich more followers at Pinterest? There’s definitely a lot involved in Pinterest marketing. I can’t add hashtags below my image I want to post now even on my computer and the #”s don’t auto populate anymore below with popularity . Has this changed recently? It’s still working for me in Chrome for Mac. I tried 4 different ways to save and it worked on all of them. I created a pinterest account 3 weeks ago and just found out about the hashtags. I have my own ecommerce store with my own images (not always as sometimes I use the supplier photos). If I put 500 keywords including 20 hashtags…my pin will not show in any hashtags. I have to put 10 to 15 words maximum in my description before the hashtag (a hack I found it to update the description and make it longer). Also, I can publish each day one pin by hashtag…if I had 2 pins with the same hashtag, only my first pin will show with this hashtag. Anyone knows if this is normal or if it is because my account is new ? It’s probably normal. Pinterest doesn’t want you to take over a hashtag by adding it to dozens of pins a day. Also, it’s no longer a strictly chronological feed. I recommend using way less than 20 hashtags though! Two questions: Firstly, is there value in putting hashtags in Board descriptions? If so, should these be within the sentence structure or at the end of the description? Secondly, as I’ve just learnt about hashtags, can I hashtag my posts retrospectively (items for sale)? Will they show up on peoples’ latest feed using the newly added hashtags? Hope that makes sense. Thank you for any advice given. Hashtags in Board descriptions? There doesn’t seem to be a benefit at this time, however if you’re rewriting the description anyway, you can add a few at the end. Can I hashtag my posts retrospectively? I wouldn’t bother, as they seem to only surface new pins. Attempting to follow your example, I cannot get a count of hashtags on my pins (new or existing.) I’ve tried it in two different browsers, with and without the Pinterest app. Has Pinterest disable this feature? Just tried and it works for me. It won’t work on existing Pins at all. I see it pinning from Chrome, whether using the Save button that appears on the image, the Pinterest browser extension, or my social share button.